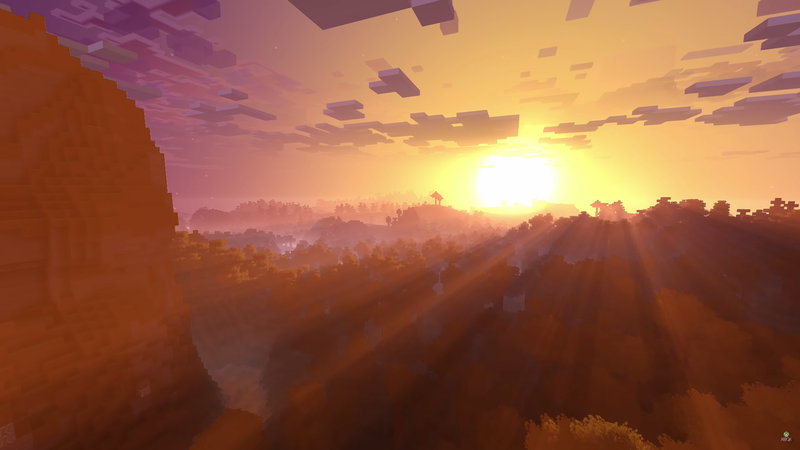 Minecraft running the “Super Duper Graphics Pack” which isn’t just for Xbox One X, but which will look great on it. You have to listen very, very closely to figure it out if you need or even want Microsoft’s powerful new console. I did so yesterday during a private demo of the Xbox One X. While the Xbox One X seems cool, it also feels very much optional, though that is arguably a good thing. On stage during their public press conference, Microsoft executives and designers rattled off spectacular stats that secure this upgraded Xbox One the status of “most powerful console ever.” In their private demo, they tried to showcase how that power is relevant to games. Microsoft’s entire E3 presence is one big sales pitch. Today, in a tent set up in L.A.’s Galen Center, they are cycling hundreds of Xbox-curious gamers through, one group at a time, leading them all through a dazzling presentation of the new unit. I got a private version of the same run-through, which was a little awkward, but also very helpful to get a sense of what they’re doing. Executives from Xbox gave an overview and then game developers who help make Forza 7, Minecraft and Gears of War 4 talked about cool stuff happening with their games. As was the case with the PS4 Pro before it, things quickly got confusing: some of the improvements Xbox One X offers only matter if you have a 4K TV and some don’t. Some of what Microsoft showed, for Minecraft in particular, doesn’t even appear to require an Xbox One X. Before you enter the demo, you pass an Xbox One X that is sitting on a podium next to an Xbox One S. That alone may be confusing to folks who file past, not just because the names sound so similar when you say them out loud, but because the sleek white S draws the eye away from the slightly smaller, black X. Both consoles have regular Xbox One controllers sitting on them. I’d later confirm that not only is Xbox One X compatible with existing Xbox One controllers (makes sense, since it also is compatible with every Xbox One game), but they’re not pushing a new controller: “Same controller,” chief of Xbox marketing Albert Penello said. When groups of gamers file into the tent today, they’ll be able to sit in rows of chairs. Yesterday I found myself alone in the room, able to sit anywhere I wanted.. If I sat in the front I’d have the best view of the 4K TV that they were using to show this stuff off. If I sat in the middle, though, I’d get the best surround sound, which was tempting because the Xbox folks said they had set the room up for really advanced Dolby Atmos surround sound. But I would have felt weird sitting in the middle of a sea of empty chairs, you know? I took a seat in the front row. Even in the front, I’d soon hear Atmos-enabled sound effects whizzing all around me. The beat of a helicopter’s blades encircled the room. Streaking missiles seemingly flew over my head as they blew up targets in Gears of War 4. All of this sounded really great, as did Xbox One product manager Ryan Moore’s comment to me that you can get these Atmos effects using special headphones, if you’re not likely to wire your room for this advanced surround sound. Cool. Maybe a reason to get Xbox One X? Not so fast. Now’s a good time to check the Xbox One S and Xbox One X comparative fact-sheet Microsoft would later send me. Compare and contrast the Xbox One X and Xbox One S features, as listed by Microsoft. Both units play all of the same games, of course. Xbox One S also does Atmos. Cool, but hmmm. Moore did say that when we were talking, but given our meeting’s focus on the Xbox One X, it was easy to assume it was an exclusive feature.This is what I mean about listening carefully. The big X vs. S differentiator isn’t Atmos audio. It’s visuals, though not HDR lighting, which looks great but is also something that both the S and X can do. No, the differentiator is 4K resolution, a bit of tech jargon that is currently dominating Microsoft’s marketing message. “We’re all about 4K, as you know,” Microsoft’s Moore said near the kickoff of my demo. He pointed out that Xbox One S supports 4K streaming and Blu-Ray, but the X is the machine for doing 4K gaming. He pulled up a still shot of the eight million pixels that can fit in a 4K image, compared to the two million pixels you can see on an HD TV running a game in 1080p. Yep, it was definitely four times as many pixels. Xbox One X will do “supersampling” for people who connect the machine to a non-4K TV, which they say will crunch those eight million pixels into something that’ll still look better than 1080p. What followed was a really neat fly-through of the “Super Duper Graphics Pack” coming to Minecraft. Egbert and his colleague, art director Brad Schubert, showed off specular map effects that allow light to make blocks in the game shiny and react differently as you move past them. “Our rails are no longer flat,” Schubert said, as the camera panned over what are now three dimensional railroad track panels in the game. “They are a great example of what we can now do with additional 3D geometry,” he said. They’re going to let more blocks give off light, are putting subtle highlighting on blocks, doing more with directional lighting, directional shadows on the terrain and mobs. And he said they’re “working on animated foliage” and improved water tech. Here’s the catch: the Super Duper Graphics pack is also coming to lots of other platforms, including Xbox One S, PC and Switch, even mobile (unclear if/when it’s coming to PS4), basically everything that’ll be running the game on the new Bedrock Engine. “It will be anywhere that you can play Minecraft in the new version,” Egbert said. “It will improve any screen on which you play, but the best experience will be on Xbox One X.” This is the theme: what you can play on Xbox One X is playable elsewhere, but, short of a high-end PC, it will simply look best on the X. The Coalition’s Colin Penty played through part of Gears of War 4 using the Xbox One X enhancement patch, which is coming to the game for free in the fall. Pente said the patch will let the game run in 4K resolution. The Xbox One X version will also get visual upgrades including real-time dynamic shadows and “up-rezzed textures for environments, characters and effects” and improved draw distance, among other things. The patch does not affect the framerate. Running in 4K, though, the game looked spectacular. Tucker Kelly, who helps market Forza Motorsport 7, played a race in that game, emphasizing the 4K, 60fps graphics of the game as it ran on the X (though he pointed out that Forza tech runs at 60fps on Xbox One S, too). As he sped his car through a course in Dubai, he drew my attention to the reflection of the clouds on the body of his car, the high resolution rendering of other cars and the impressiveness of the rocks on the periphery of the course. He pointed out the vibration of the windshield wipers while in cockpit view. How much of this can only be seen on the X is unclear, though it was undeniable that in 4K this game, like Gears, looked terrific. The showcase took about 20 minutes, and then I got to pepper Penello, the Xbox marketing boss, with questions. Power brick? No. It uses an internal power supply, Penello said, and connects with the same power cable that plugs into the Xbox One S.
For people (such as me) who have 1080p TVs, will the Xbox One X recognize our displays and divert power from 4K rendering to other stuff? Penello’s simple answer on that boiled down to no, saying developers will decide how to use the X’s power, be it to improve resolution or framerate and then have the system do that regardless of display. Games outputting in 4K will do the aforementioned supersampling for 1080p sets. It’s easy to be skeptical about the Xbox One X, as it was the PS4 Pro before it. Both consoles provide superficial benefits without doing anything that demands you buy them. Look at it another way, though, and that’s a positive. The Xbox One X is a mighty machine, but it doesn’t close off the current generation of consoles prematurely. It’s not a device that augurs in a whole new line of games that can’t be played on the Xbox One you may already own. These mid-generation enhanced consoles are a new idea, and it’s not clear if they sell well. Maybe they at least serve as a deterrent to keep people from switching sides, offering the deep-pocketed loyalist a higher-end console to buy, when they might otherwise use that money on one of the competition’s devices. Whether or not these consoles sell is more the concern of corporations than fans. For people who enjoy games, Xbox One X is simply an additional option. It’s a box that’ll make games look better and maybe run better, and whether that’s $500 worth of better, it’s hard to say. Microsoft isn’t showing anything at E3 that makes getting an Xbox One X a no-brainer. And if you really pay attention, you’ll notice they’re even showing a lot of reasons that sticking with an Xbox One S would be perfectly fine.